An initial meeting was held in 1995 and saw the gathering of a range of interested parties such as academics, consultants and State government staff that developed an initial interest in the subject. 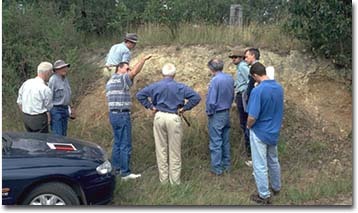 Further gatherings were initiated at a later date from which a group that meets regularly developed, known as the Victorian Geomorphological Reference Group (VGRG). A range of views was expressed at these meetings but it was decided that to provide a framework for land systems an evolutionary process was sufficient rather than a revolutionary approach. A number of field trips have helped to blend views of both the geologist, geomorphologist and the pedologist (soil type development and distribution). An outcome has been the blending of approaches to understanding the land, which takes in subsurface processes to a greater extent than in the past: a top down and a bottom up approach. The use of newly available technology such as gamma radiation imaging (radiometrics), digital elevation models research into (geological) regolith mapping, geological structural mapping and old fashioned soil survey, have provided new insights into the distribution of land types, their likely genesis and their behaviour under different external forces. Drs Bernie Joyce and Neville Rosengren were nominated to assimilate the views of the group and produce a revised scheme. The provisional result is a revised geomorphological scheme that has seven first tier units, twenty-seven second tier units and seventy-seven third tier units. Another outcome of the review has been the realisation that a third tier (greater complexity) of geomorphological division would be useful in assessing how different land types behave. It also helps to define the second tier level of units. While there is much scope to define and map these third tier units in the future, examples are mentioned in the preliminary documentation for most of the units. The third tier units help us to understand the complexity of the larger units such as the Eastern Dissected Uplands as well as the smaller discreet units such as the Dundas Tablelands. A further major outcome from this review is the proposal to link the Gippsland Riverine Plain (currently a separate geomorphic region) to be part of the Southern Victorian Coastal Plains. Mr P. Dahlhaus - Senior Lecturer, Geology Department, Ballarat University. Consultant to Private Industry and DEPI. Mr Richard MacEwan - Soil and Land Specialist, DEPI. Mr. M. Imhof - Soils Specialist, DEPI. Dr. E.B. Joyce - Associate Professor, Geology Department, Melbourne University. Former CRC LEME member. Consultant to Private Industry. Technical Convener. Mr. J.J. Martin - Soil Surveyor (former Dept of Agriculture, Victoria and Northern Territory). Consultant for DEPI. 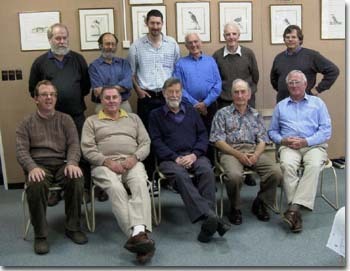 top row (left to right): Peter Dahlhaus, Neville Rosengren, Mark Imhof, John Neilson, John Martin, Richard MacEwan.